I promised another Easter Bunny so here he is, this is Patches the Bunny with his basket of Easter eggs. I am not going to say too much about how I made Patches the Bunny because he was designed by Dylan Gelinas from Slightly Twisted Balloons, you can purchase the instructions to make him from the Slightly twisted website (link) and it is well worth the effort as I think he looks excellent. 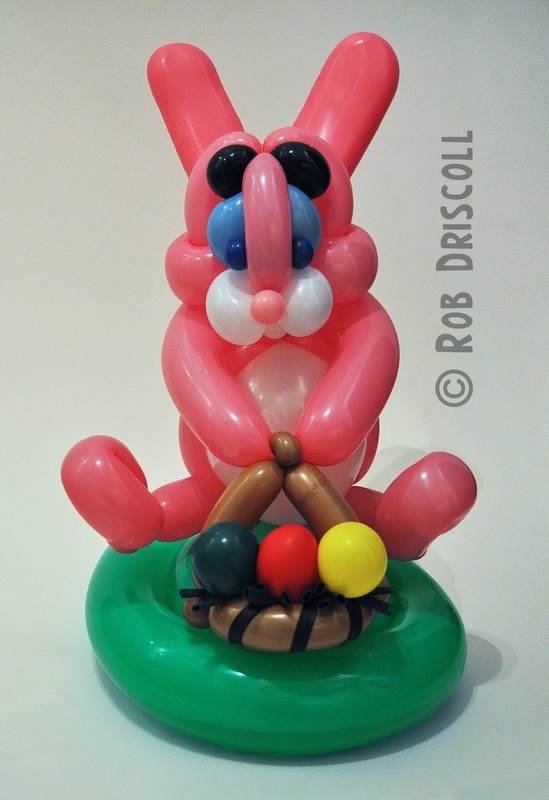 He is made from 23 balloons (I think) and the ears are just genius as they are NOT round but flat just like bunny ears, "how on earth do you do that?" I hear you ask, well you will have to buy the instructions to find out. I will be featuring some more of Dylan's designs in the near future so keep watching, Happy Easter everyone.